Wrexham player-manager Andy Morrell believes his side have given themselves a fantastic opportunity to reach the Blue Square Bet Premier play-off final. 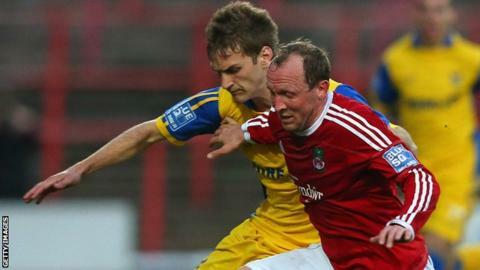 A late Neil Ashton penalty gave the Dragons a 2-1 lead to take into Sunday's second leg semi-final at Kidderminster. "We've got a huge job because they're very good at home," said Morrell. "But we're not bad away either so we'll be going there full of confidence and try to nick something." Ashton's 85-minute penalty earned Wrexham victory at the Racecourse after Dave Artell's opener was cancelled out when Michael Gash levelled from the spot. Wrexham's build-up had been hampered by a lengthy injury list but Morrell says his players can "unquestionably" continue to battle against end-of-season niggles to reach the play-off final at Wembley on 5 May. He added: "They're an absolutely fantastic set of lads and they will throw their bodies in for the cause. "I'm sure they'll have full 24-hour treatments for the next four days and then we'll drag them back out and see what happens. "You just don't want to be out of the tie.... like we have been over the last couple of years. "I know we've nearly got back on both of them [against Luton], but you don't want to give yourself that mountain to climb. "And we haven't this year. We've given ourselves half a chance." Wrexham's win on Tuesday was their first over Kidderminster this season, having lost 2-0 in December and 2-1 at home in April. Kidderminster, who finished 13 points ahead of Wrexham in the table, have won eight and drawn one of their last nine games at home. But Morrell said: "As long as we go down there with the same attitude and same commitment, we'll be OK.
"[We need] the same - application by everybody. Even the lads that aren't involved need to get right behind the lads. "It's a really tight-knit group we've got and they're all saying the same thing - we're only halfway there. It's not a done job." Goalscorer in the first leg after a successful appeal to the Football Association of Wales against his red card in the last minute of Saturday's defeat by Mansfield. "Well it wasn't a sending off so that's why we appealed [against] it and that's why we got off it," said Morrell. "So the suspension doesn't stand and he plays. And I thought he did great… as did all the lads that picked themselves out of the treatment room. "And to dig deep and show the energy levels and tempo that they played at was fabulous."